Welcome to the China Forum. 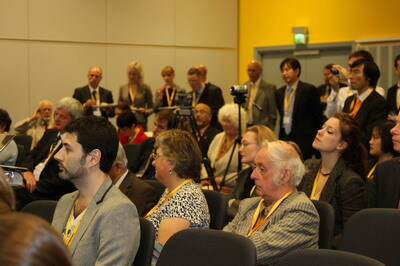 This year's Liberal Democratic Party Conference is the first Party Conference for you as a ruling party. 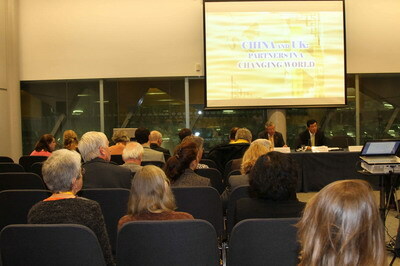 I'm glad to say that this is also the first China Forum I hosted as the Chinese Ambassador to the UK. First, the world is getting "flat". Global economic, scientific and political changes are removing barriers and making the flow of resources, technologies and people much easier across the world. At the same time, multinationals and NGOs have become new players in the diverse networks of international relations. We now live in a world freer and more open than ever before. Second, the world is getting "small". Modern means of transportation and communications have brought people closer and made our planet a "global village". What happens in one part of the world, be it the financial crisis or the swine flu, can quickly spread elsewhere. People can enjoy the Beijing Olympics and the Shanghai World Expo no matter where they are. No single country can stay immune from the impact of a crisis, nor can it turn its back on working with others. Third, the world is getting "diverse". As an ancient Chinese saying goes, "One blossom doesn't suggest spring, which is made up of flowers of all colors and fragrances". One-size-fits-all solutions, be it values, political systems or development model, cannot work everywhere. We are embracing an era of dialogue among different civilizations and an era of mutual learning between different values and development models. Fourth, the world is confronted with more challenges, ranging from regional conflicts, widening gap between the South and the North, terrorism, separatism and religious extremism, to trans-national issues such as environmental pollution, drug trafficking, and the spread of infectious diseases. Lasting peace and common development remain a long and daunting task. China has also changed. First, China became the 2nd largest economy in the world. It may well contribute to 30% of global growth this year. It has been working hard to restructure its economy, boost domestic demand and upgrade its growth model for healthy and sustainable development. Secondly, China has become an increasingly dynamic society. More and more farmers now choose members of their village committees through direct elections. China has nearly 2,000 newspapers, 700 million mobile phone users, 400 million internet users and 180 million bloggers. In a single month, 40 million internet users signing up to a famous Chinese blogging website. Thirdly, China is playing a bigger role in the world. It is actively involved in international efforts to tackle global challenges and has contributed to world peace, stability and development. China was the first developing country to adopt a national programme to tackle climate change. It committed itself to a voluntary emission reduction target of 40% to 45% of carbon intensity by 2020 against 2005 levels. It has sent 15 thousand peacekeepers to 24 UN missions, making it the largest contributor of peacekeepers among the five permanent members of the UN Security Council. The UK is changing as well. The general election this year has produced the first coalition government since the Second World War and put the LibDems in the government for the very first time. The coalition government is now committed to fostering growth, conducting social and constitutional reforms and maintaining Britain's position and role in the world through active diplomacy. 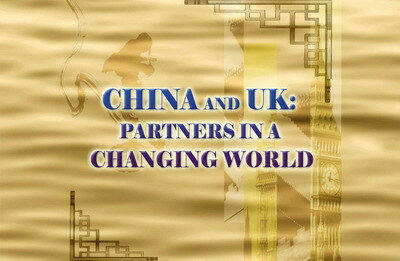 In the context of all these changes, I believe we should do the following to promote China-UK relations. Firstly, cultivate greater understanding. In this "flat" and "small" world, countries should abandon the zero-sum-game mentality and view each others' development as opportunities instead of threats, treat each other with trust instead of suspicion. Only by so doing can we be strategic partners and effectively meet challenges we both face. China remains a developing country with more than 1.3 billion people and a per capita GDP of a little over 3,700 US dollars last year, ranking behind 100 countries in the world. Over 700 million Chinese are still farmers. 150 million live in poverty. And there are serious imbalances between urban and rural areas and among regions. It will still take many years for China to reach the living standards of the British people. The road to prosperity for all in China remains a long and difficult one. China will continue to pursue peaceful development. Our top priority is to raise our people's living standards through economic growth. That is why China's foreign policy aims to maintain world peace, promote common development and create a peaceful and cooperative environment for domestic development. China believes security will only be possible with mutual trust, mutual benefit, equality and coordination and is committed to building a harmonious world of lasting peace and common prosperity. China does not and will not seek hegemony and it will never pose a threat to anyone. Secondly, strengthen and expand cooperation. Our economic complementarity means a promising future for our cooperation. The coalition government seeks "closer engagement" with China and sees our two countries as "partners in growth". This is a wise way to define our relations. We need to explore more areas, tap potentials and nurture new growth areas of our cooperation. My experience from visiting the midlands and Northwest England and the City of London shortly after my arrival told me that across many industries, from aeroplane and automobile, high-end services such as financial services and consulting, information technology and shipping, to environment-friendly and low-carbon industries, there is a huge demand in China for UK products, technologies, and managerial expertise. Meanwhile, the UK can capitalize on China's manufacturing strength to meet domestic needs, keep inflation low and achieve economic recovery. 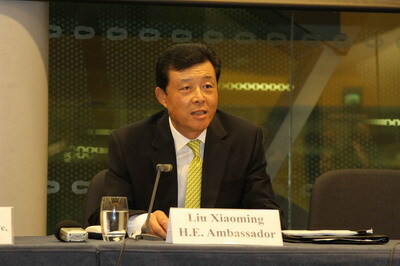 On the international arena, as permanent members of the UN Security Council, China and the UK share extensive interests and responsibilities in maintaining peace and stability, promoting global economic recovery and sustainable development and meeting global challenges, which makes it all the more important for the two countries to work together. Thirdly, properly handle differences in a spirit of equality and accommodation. Given the differences between China and the UK in national conditions, historical and cultural heritage, social system and phase of development, it is only natural that we do not see eye to eye with each other on certain issues. What we need are more dialogue and better understanding. It is no longer feasible in today's world to impose one's standards or values on others. Chinese students start to learn English as early as in primary school. They know a lot about Shakespeare, modern capitalist revolution, James Watt and his steam engine, the Premium League and many other things about Britain by the time they reach college, while an average British person may not know as much about China. I am happy to see an emerging "mandarin fever" in this country, and more and more Britons learning to enjoy Chinese festivals and culture. We need to encourage our people, young people in particular, to deepen mutual understanding and friendship, to lay the foundations for sound and steady growth of China-UK relations in the long run. The Liberal Democrats' Constitution starts with these words, "The Liberal Democrats exist to build and safeguard a fair, free and open society". China has also endeavored, in the past 32 years with reform and opening-up to develop its economy and make the country prosperous on the one hand, and bring about democracy, freedom and social justice to its people on the other. By coming here, I want to register our commitment to build closer ties with the Liberal Democratic Party at government, parliament and party-to-party levels for better mutual understanding and healthy and sustained growth of China-UK relations. Thank you. I will be happy to take your questions in a few minutes.